Why is Brow Shaping important? Eyebrows are one of a person’s most prominent facial features because of the many functions to one's face. They help accentuate the eyes, shape the face and even shows facial expressions to enhance communication. Of course, not everyone is born with perfectly-manicured brows; so to achieve an aesthetically-pleasing look, eyebrows should be routinely trimmed, shaped, and filled. Or go MICROBLADING for a hassle free perfect brows anytime, anywhere! Did you know that a beautifully groomed eyebrows is one powerful anti-aging secret? As one of the first things people notice when they look at you, no amount of makeup can cover for bad brows. What properly shaped brows can do is to give lift to your face and make the eyes appear larger and more youthful. Some people lose eyebrow hair as they age, or go to salons and get their brows over plucked which unfortunately most of the time our precious hair won't grow back. Microblading gives hair like strokes to your missing patches and gives fuller brow look to the thinning ones and all looks natural like real brows! The right eyebrow shape can frame and flatter the eyes. The wrong one can make you appear aged, tired, or angry. However, there is no one “right” eyebrow shape. Establish the right brow shape for you by examining your face and eye shape. Current brow trends may also play a role in the shape and thickness of your eyebrows. Microblading measures your eyebrows to perfection with the length, proportion, symmetry, thickness and color. Without regular maintenance, your eyebrows can appear bushy and unkempt. In contrast, a well-groomed brow can create a polished look that enhances your appearance. Even without a drop of makeup, a woman with well-kept eyebrows will typically appear more clean and refined. Microblading can provide this refined look all the time 24/7! Wake up, shower, sleep, exercise with perfect brows all day and night! No human has a perfectly symmetrical face but most of us aim to have one. Eyebrows that are unsymmetrical can throw off your facial balance, making one eye appear larger than the other or changing your entire look altogether. Well-structured brows that are more symmetrical in nature are pleasing to the human eye. 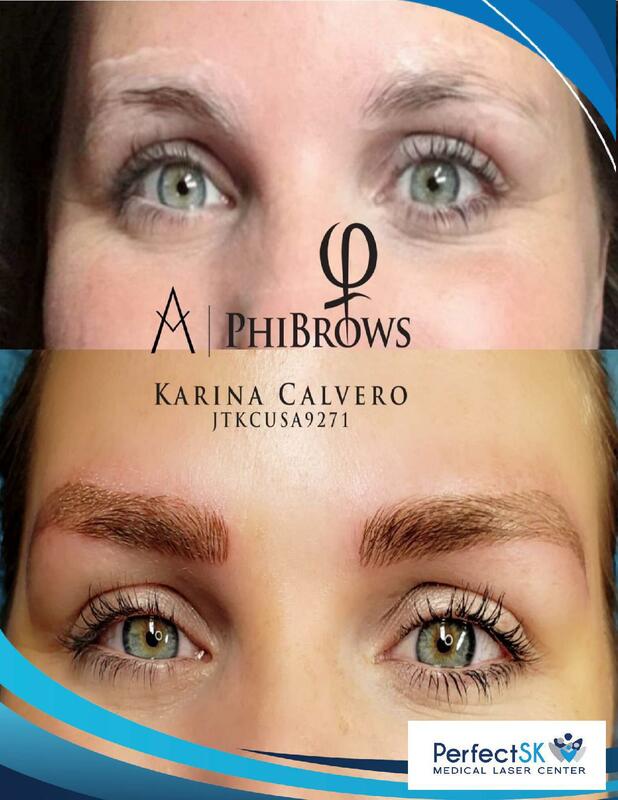 Microblading solves that problem for you no matter how uneven your brows are, expert training from a certified microblading artist can even out the brow field with precision. Eyebrows have the power to completely change the look of the face by correcting minor flaws such as small eyes or eyes that are too far apart. The right brow shape can add length and definition to your face. It can also draw the eyes to the upper portion of the face to distract from imperfections on the bottom portion. The right measurements in microblading can correct flaws. No more stencils, or erasing uneven brows.... you wash your face and you are ready to go and be awesome! While you can’t change your face shape, you can modify your eyebrows which in turn alter how your face shape looks. For example, a flat eyebrow shape tends to shorten the face shape. Therefore, women with longer faces may choose a flat eyebrow shape to create the illusion of a shorter, more balanced face. Microblading and makeup artists know the best shapes ideal for corrective techniques to help you have a beautifully framed face. It's semi-permanent. Microblading is done with a hand-held tool made out of 8 micro needles shaped uniquely. This puts pigment into the skin, but doesn't go as deep as a normal tattoo would. How does it differ from an eyebrow tattoo? The pigment penetrates only up to the epidermis of the skin drawing on tiny lines that look like individual hairs. It is so natural looking and not the scary type that changes color to red or blue like a permanent tattoo does with time. We use pigments that stay true to your natural hair color. 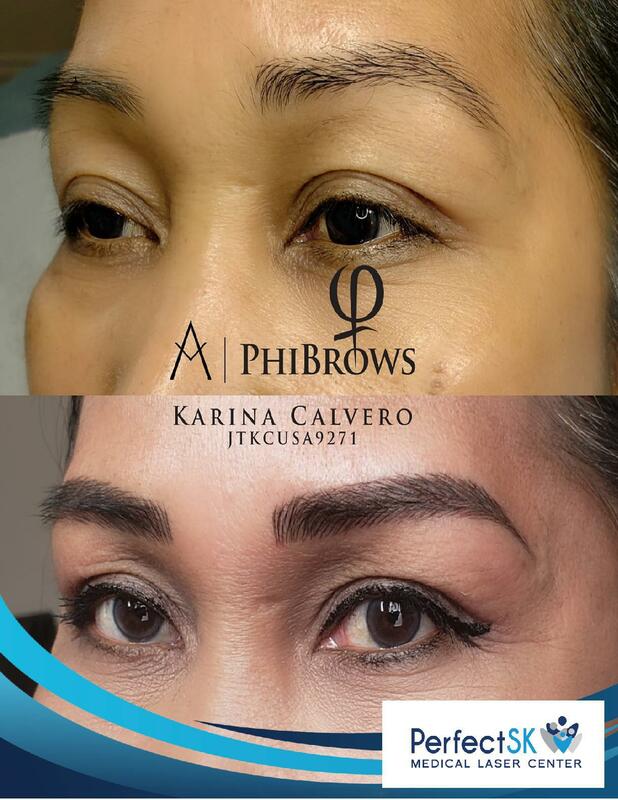 Phi brows uses ink that does not contain metal which causes harm to the body. Our pigments are safe and we are well trained to choose and blend the closest color to your real brows! For most people it will be from 1.5 years to 3 yrs depending on the skin type. Oily skin tends to have lesser pigment retention than normal to dry skin, but it will just gradually fade in time. You can have your brows microbladed again after 3 years. It will be about 3 hours. The most tedious part is the eyebrow shaping. I make sure the symmetry is perfect. I show you my professional recommendations, however I always make sure, it will be your prefered shape, thickness and color density. I shape it according to your bone structure, shape of your face and muscle expressions. Before the session, I will apply a numbing cream to soak into the skin for 20 mins. If you have low pain tolerance, I suggest you may also take 2 tabs of tylenol 30 mins before. It will feel like micro paper cuts, or like hair plucking. If you are used to eyebrow waxing or threading, then microblading will feel less painful than those. Make sure you avoid any form of stimulants like caffeine or alcohol as this will increase blood flow through the skin. Do not use blood thinners like aspirin and don't exercise before your session. Color retention and healing is also dependent on how you take care of it post microblading. You will receive step by step instructions and an after care kit pack to ensure your brows are kept clean and protected from any infection.